(Homesteading.news) Jack had it right when he planted the magic seeds that grew into a sky high beanstalk. Not only did he stumble upon the principles of vertical gardening; but Jack also discovered the path to abundance and self-reliance when he realized he could provide for himself and his family as a result of the riches he discovered after growing vegetables vertically. Just like with most new ideas, at first the idea is novel and a small group of people embrace it while others look on thinking they’re crazy; however, there comes a tipping point when enough people recognize that the crazy idea is actually the leading edge of genius and all of a sudden, everyone’s doing it. That’s what’s happening with the idea of growing food vertically, taking advantage of the uncharted sky and reducing your garden’s footprint. Essentially, there are two types of vertical gardens — those that grow in soil and those that grow in water. Water-based growing mediums are either aquaponic or hydroponic. Hydroponics is a method of growing vegetables and other plants in water without soil and nourished with a mineral nutrient. Aquaponics is a growing system combining the raising of aquatic animals such as fish with hydroponic gardening, where plants are cultivated in a water medium all in the same tank. The symbiotic relationship between the plants and animals produces a vital growing medium and a sustainable food production system. Both systems provide organic or non-organic growing environments for vegetables. So, why would you want to take advantage of growing a garden vertically, instead of in a traditional garden plot? There are lots of reasons. 1. Old souls love to putter in the garden, but the oldest of souls usually complain about their backs and knees hurting. 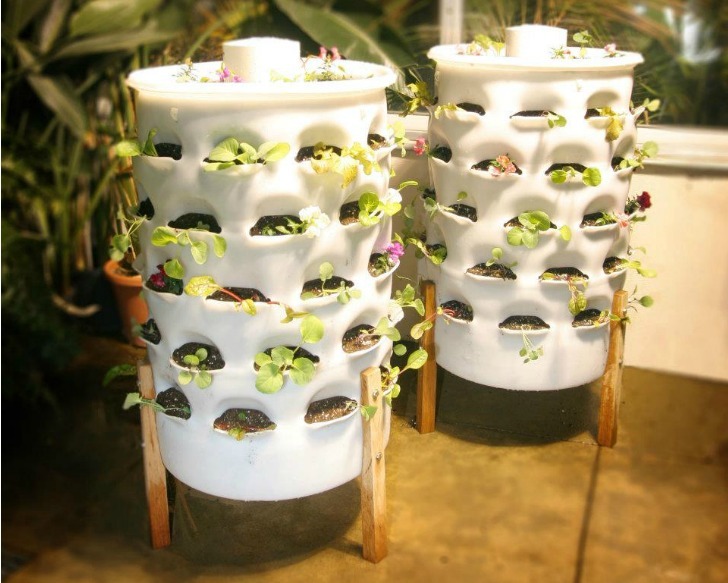 Vertical gardening enables you to grow veggies without ever bending or getting on your knees again. Grow vertically in plant pockets, hanging planters, stacking containers, recycled pallets, in stacked flower boxes, table garden systems, plant trees, in greenhouses on tables and up-cycled ladders. If you can imagine it, you can grow it. 2. Save space with a vertical garden, especially if you have no land or a very small yard. Grow up the side of your fence, on a wall, the deck, your balcony, in a green house or even inside in the garage. 3. Some vertical garden systems are portable and can be moved from outside to indoors on wheeled apparatus. 4. Grow inside during colder month, using a grow light. 5. Community gardens are easy to set up, even in small, indoor spaces. 6. There’s much less work and time involved when preparing vertical gardens — no tilling, no digging. 7. Use less water because in many vertical gardens, water is recycled through the planting system. 8. You’re dog won’t dig up your garden, and neither will rabbits or deer. 9. It’s an easier way to protect your plants from soil-borne pests. 10. Companion gardening is easy and even more advantageous when you can move planters around to take advantage of beneficial conditions. 11. Using no soil means no weeds or fewer weeds in less soil. 12. Increase vegetable yield. Relocate plants to better take advantage of light and air circulation. 13. My favorite reason for being a fan of vertical gardening is to avoid the prying eyes of municipal authorities — those people forcing others to dig up gardens and destroy their food supply. Vertical gardening allows you to grow food in less obvious places, even under grow lights, out of site of the food police. Just remember, it’s never too soon to plan your new vertical garden project. By JB Bardot, Natural News.